This exquisite curvy tattoo damask wallpaper will add global flair to your home. It combines versatile black and white colours with a hint of mica. This wallpaper uses paste-the-wall technology, so it's quicker and easier to hang and is less messy. Experience the sophistication and personality wallpaper adds to your dicor without the hassle. Our beautiful floral design "Amy'has subtle gloss pinstripes, and shimmering glitter highlights layer to create this stunning diamond geometric effect. This wallpaper is a real eye-catcher adding a great character to any wall. With an intricately detailed background this wallpaper can be beautifully coordinated with Tori. Classic 3.5 inch wide vertical stripe of colour on light grounds; available in a curated colour palette by Magnolia Home. Stripes order space and soothe the eye. Every home should have one. Manufactured on SureStrip", a unique high performance substrate, this ultra-easy removable wallpaper is guaranteed easy to install and easy to remove; simply use water to activate. Framed chalkboard looks like the real thing, and act like it too, in this scroll-trimmed wallpaper printed in a gallery wall panel grouping with usable chalkboard inks; so leave a message! Manufactured on SureStrip", a unique high performance substrate, this ultra-easy removable wallpaper is guaranteed easy to install and easy to remove; simply use water to activate. Create the effect of decorative French-inspired wall panels against a cream ground in this distinctive wallpaper which creates the look of ornately adorned gallery walls. Designed for usability, it coordinates with every dicor style. From formal to farmhouse, these panels enhance space with the look of ornate architectural trim. Manufactured on SureStrip", a unique high performance substrate, this ultra-easy removable wallpaper is guaranteed easy to install and easy to remove; simply use water to activate. 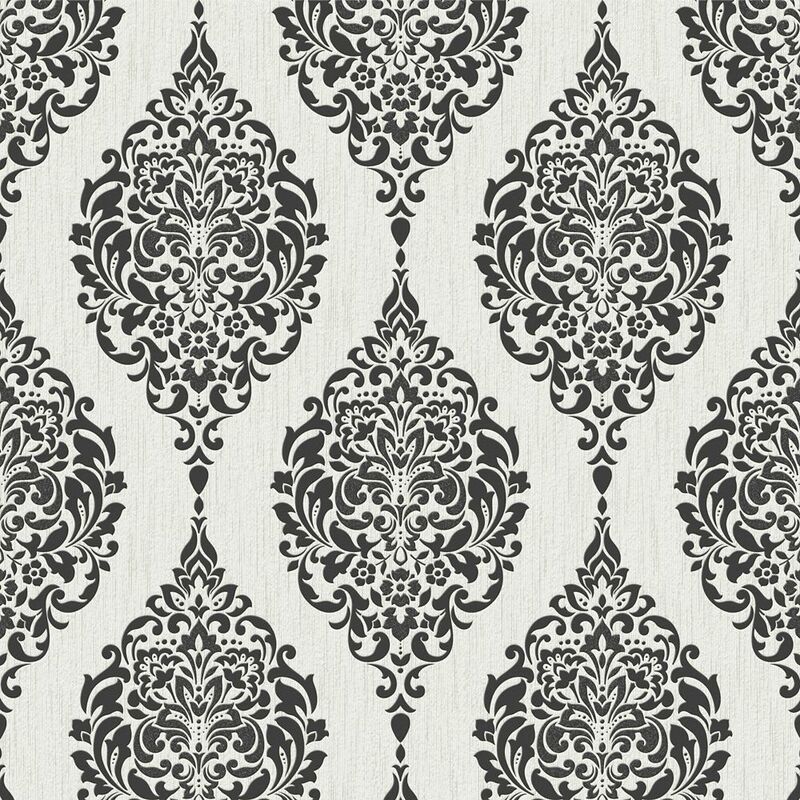 Luna Black/White Wallpaper This exquisite curvy tattoo damask wallpaper will add global flair to your home. It combines versatile black and white colours with a hint of mica. This wallpaper uses paste-the-wall technology, so it's quicker and easier to hang and is less messy. Experience the sophistication and personality wallpaper adds to your dicor without the hassle.